It's a blessed Easter day and I'm wishing you the best of the Easter season. I have an adorable bunny to share with you but I have no information about it, unfortunately. I found it in my folder of images I had colored who-knows-when and this one was so long ago, I simply don't remember who made it, where I got it, or what I had planned for it but I'll bet it was something I prepared for Easter last year and then didn't use. Isn't that just the softest thing you've ever seen? I want to reach right out and cuddle her gently in my hand. One thing I do know is that I used my ProMarkers to color that fuzzy bunny because I only have that many shades of gray in my collection of ProMarkers. I probably used a black pencil for the more distinct hair lines and white gel ink for the highlights in the eyes. Since the image was so large, I decided on a CAS design. I added ribbon, a double bow made of lace and satin, and some pink tissue paper to border two sides of the image. Happy Easter dear Connie, a gorgeous card and just love the cute bunny. Sweet! Thanks for joining us at Craftaholics R Us! Absolutely DELIGHTFUL, love the Bunny, he is adorable and love the CAS style too. Hope your Easter was good. Oh wow this is super cute, the colouring of the bunny is amazing, she looks so real. Thanks for joining us over at CRAFT. OMWord, that is the cutest little bunny. Your expert coloring really brought her to life too. This is such a little cutie - I wanna just give him a big cuddle! I'm in love with your bunny! The eyes are so awesome! Great job! Thank you so much for entering our challenge at Crafty Gals Corner Challenges this week. Be sure to join us next week too! She is adorable and so realistically colored. 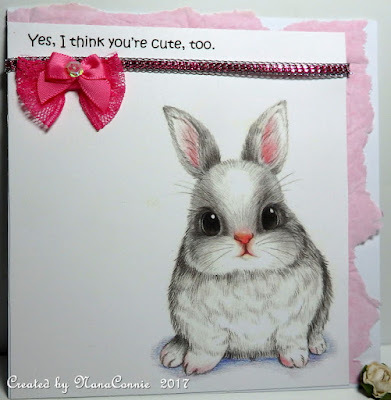 I think she is about to hop right off the page.. (^_^) ..
You really coloured this cute bunny so beautiful! And what a lovely stamp it is! Love your sentiment you used. Goes perfect with that little bunny! Thanks for joining in the CRAFT Challenge and good luck. Greetings, Caroline. Fabulous colouring! Your bunny looks so realistiv! Thanks for joining us at Quirky Crafts. Very cute card, well done! Thanks for joining us at The Crazy Challenge. So adorable!! Thank you so much for sharing with Lemon Shortbread Blog Challenge! Your card is CUTE!!!!!!!!!!!!!!! Thanks so much for participating in our LEMON SHORTBREAD challenge. Hope you participate in our next challenge!! Have a happy crafty day!! !